Mark Harrison (left) and Andreas Oesterer watched a drone in Berkeley, Calif. A subculture of drone hobbyists has arisen. BERKELEY, Calif. - Sharp-eyed dog walkers along the San Francisco Bay waterfront may have spotted a strange-looking plane zipping overhead recently that looked strikingly like the US stealth drone captured by Iran in December. A few key differences: The flying wing seen above Berkeley is a fraction of the size of the CIA’s waylaid aircraft. And it is made of plastic foam. But in some ways it is just like a real spy plane. The 4 1/2-foot-wide aircraft, built by software engineers Mark Harrison and Andreas Oesterer in their spare time, can fly to specified GPS coordinates and altitudes without any help from a pilot on the ground. A tiny video camera mounted on the front can send a live video feed to a set of goggles for the drone’s view of the world below. 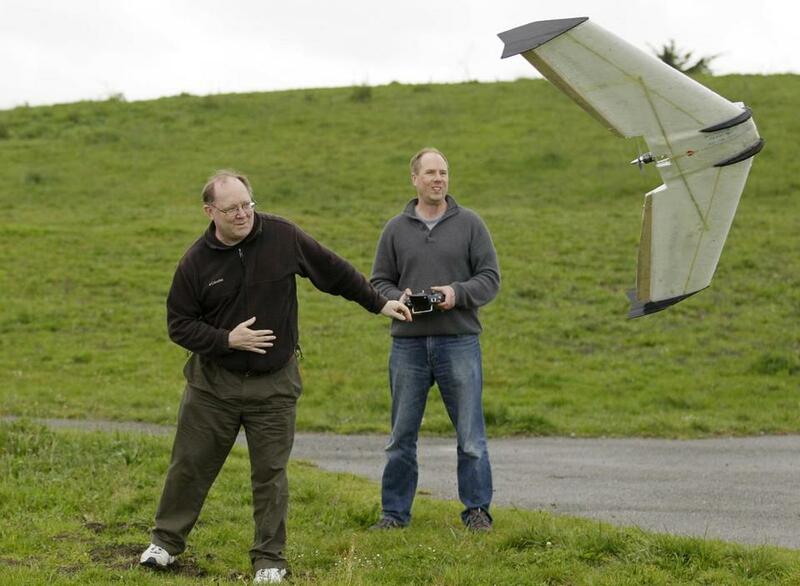 Mark Harrison prepared his drone for a flight over a Berkeley, Calif., park. New rules for drone use are coming soon. “It’s just like flying without all the trouble of having to be up in the air,’’ Harrison said. Thousands of hobbyists are taking part in what has become a global do-it-yourself drone subculture, a pastime that is thriving as the Federal Aviation Administration seeks to make the skies friendlier to unmanned aircraft of all sizes. The use of drones in the United States by law enforcement and other government agencies has privacy advocates on edge. At the same time, some DIY drone flyers believe the ease of sending cheap pilotless planes and choppers airborne gives citizens a powerful tool for keeping public servants on the ground honest. Drones are the signature weapon of US wars in the 21st century. Just as Humvees became a presence on US highways in the 1990s after the first war with Iraq, interest in nonmilitary uses of drones from policing to farming is rising. Government agencies currently need FAA permission on a case-by-case basis to fly drones domestically. Commercial use is banned except for a small number of waivers for companies building experimental aircraft. But lawmakers have instructed the agency to allow civilian use of drones in US airspace by September 2015. The FAA is expected to take the first step this year by proposing rules that would permit limited use of small commercial drones. Whether with a border patrol drone the size of a single-engine passenger plane or a four-rotor police “quadcopter’’ equipped with gear to intercept cellphone signals, the increasing ease of aerial surveillance seems destined to be put to a constitutional test on privacy. Lynch has sued the FAA for a list of the 300 waivers it has issued to allow drone use in the United States. At the same time, she said, drones in the hands of average citizens could have important uses. Among the groups seeking to take advantage of the steep drop in price of drone technology are journalists who want to attach cameras to aircraft the size of small pizzas and that cost as much to buy - about $400 - as a one-hour helicopter rental for a photographer. In the San Francisco Bay area, Occupy Wall Street activists built a so-called Occucopter to monitor police action against protesters from the sky. Hobbyists say drone prices have been driven down sharply even in the past two or three years primarily by the surge in popularity of smartphones. The chips smartphones use to determine whether they are being held vertically or horizontally or to locate themselves on a map are the same ones drones use to keep themselves flying straight, level, and in the right direction. “Today, if you have an iPhone or an Android, you basically have an autopilot in your pocket. You’re just running the wrong app,’’ said Chris Anderson, editor in chief of Wired magazine and founder of DIY Drones, an online community and company that sells drone kits and parts. Anderson started DIY Drones in 2007 after spending a weekend building an electronic Lego robot and trying to fly a radio-controlled plane with his children. The robot did not impress the children on its own, and the plane was hard to fly, Anderson said. So the family used the Legos to build a primitive autopilot and attached it to the plane. For a few weeks, the children thought it was cool, but Anderson became obsessed. He said safety is a top consideration of his group, and he supports strict observance of FAA rules developed in the 1970s to cover the amateur use of radio-controlled planes, which also apply to today’s DIY drones. Those rules include restricting their altitude to 400 feet, requiring them to always be in view of their controller on the ground, and prohibiting them from being flown over built-up areas. That last rule reportedly led to trouble for some Los Angeles real estate agents, who were warned by police to stop using drones to take photos and videos of homes for sale, according to The Los Angeles Times.